TANGRAMS  A Design Tool! "Tangrams - The Magnificent Seven Piece Puzzle"
What are they saying about this Tangram book? "As I read through the book, I felt that the title of the book could have been, 'Art and Poetry through Tangrams'. The sections on 'The Seven Pieces' treat each of the pieces with beautiful tangram figures illustrating poems about each piece. And the 'Masterpiece' section uses mutliple tangram figures, sometimes by reflection, to achieve dramatic artistic patterns. Sam Loyd's whimsical Tangram Cats illustrating an Ogden Nash poem is a nice touch." "What a beautiful book. I find the book more inspirational and motivating than how-to or puzzle books. It makes me want to play... Having enjoyed the whole thing, I go back to check on technique, detail, clarity. The shading that provides dimension makes one want to touch. A Magnificent production!" 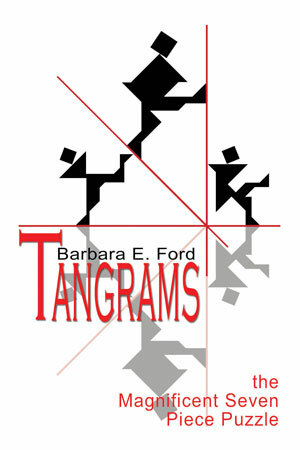 "Barbara Ford's, Tangrams - The Magnificent Seven Piece Puzzle, combines beautiful graphics with whimsy and clarity in a 'must have' book for all ages." these seven pieces over again and again. Learn about tangrams. Start designing! Email randyford@snowcrest.net with any comments, questions or problems.